You always heard when you were younger... "It's not good manners to play with your food." Oops. I love playing with my food. It is also one of the ways I can get my kids to eat healthy snacks and meals. Cucumber slices, tomatoes, raisins...sounds boring. BUT when you fix those same things up to make it look like a caterpillar...that's exciting! "Kids...we are eating caterpillars today!" Now that gets their attention. In addition to my stay at home mom status, I am also a preschool teacher and daycare provider. Snack is one of my favorite things to plan. I take the book or theme we are learning about that week and try to figure out a fun snack to make. 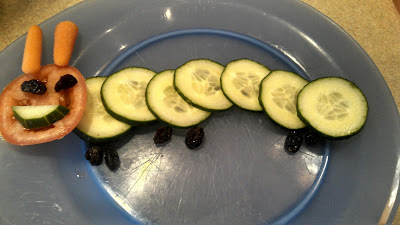 So now, of course, I have the fun challenge of making a Paleo theme-related snack. I love it. 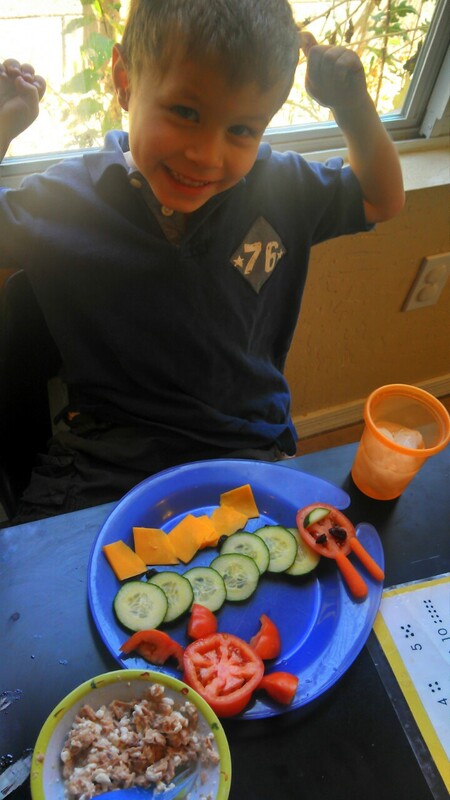 It's interesting to see how excited the kids get when you created something fun with food. They don't even care they aren't getting gold fish or Graham crackers. They are eating the character from their book. That's way cooler. So enjoy this Very Hungry Caterpillar...Paleo style.